Live Load is the variable weight burdened by a structure, such as moving traffic on a bridge, furniture and people in a high-rise office building, or the weight of a person sitting on a chair. The process used to make these images is adapted from Sergei Mikhailovich Prokudin-Gorskii (1863-1944), whose documentations of the Russian countryside between 1909 and 1912 are among the earliest colour photographs. This work predates colour film technology, therefore Gorskii used a specialized camera to take three black and white photographs in rapid succession, each frame with a red, green or blue filter placed in front of the lens. 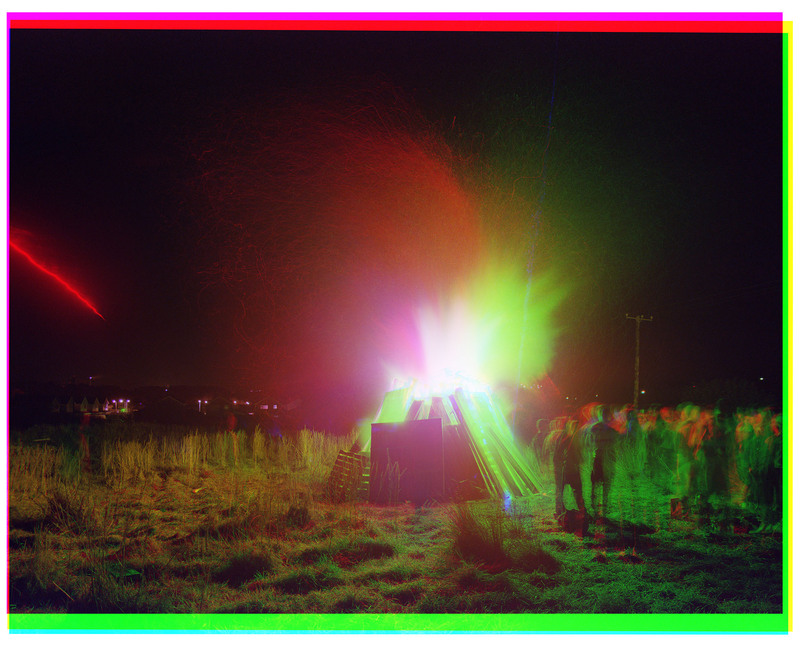 These images were then recombined, projected with their corresponding filtration to reveal full colour images. Without the same specialized camera my process is slower. The time between frames can take up to several minutes depending on the wind, a change in the lighting conditions or difficult terrain. The artifact of the resulting image appears when subjects in the frame are in motion. Both a cow grazing in a field or a tourist wandering an archeological site are frozen in a single channel of light, appearing cyan, magenta or yellow. Originally from Philadelphia, Abruzzese obtained his Bachelors Degree in Moving Image Arts from the College of Santa Fe, New Mexico in 2000, and Master of Fine Arts from the San Francisco Art Institute in 2004. He received the Emerging Photographer of the Year award from San Francisco Magazine, and as a photographer, exhibits internationally in galleries and universities. In 2007, with his wife Rosie O’Gorman, Abruzzese founded Cow House Studios, a progressive artist studio set in rural Wexford, Ireland, where he now works as both Co Director and Photography Instructor. Abruzzese’s work is driven by his interest in the power of the photograph to reveal as much as it hides. He has an interest in engineering and problem solving, new technologies, beauty through symmetry, science fiction, landmarks, repetition, traces and monuments. His working methods are experimental and process driven. Abruzzese is also drawn to subjects that are both familiar and often overlooked, and applies photographic techniques to transform the mundane into something extraordinary or ambiguous. He aims to investigate how his subject might collide with traditional interpretations of the landscape, architecture or portraiture, and how these expectations can be met through alternative means. To do this he uses film selection, exposure and digital techniques to make small incursions into perceptions of photography’s assumed role as factual document.